We are delighted to announce a surprise release! 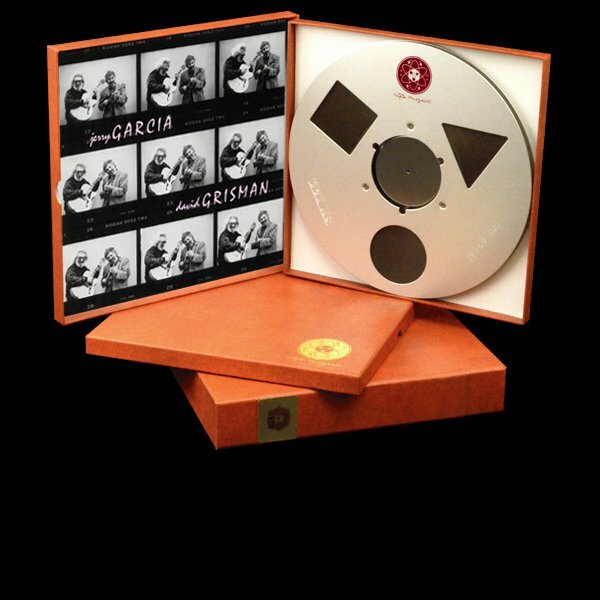 Just a few weeks ago we managed to secure the license to Jerry Garcia / David Grisman from David's label, Acoustic Disc. It's the first of a wonderful series of collaboration albums by these two great artists. We decided this was such a special album it needed to be released as soon as we could duplicate enough albums for our loyal and incredibly patient original subscribers. And we managed to produce a few more albums for sale online. All the while we did our best to keep our everlovin' mouths shut about this. Well today is the day we can crow about it! As I am typing this the subscriber albums are being picked up by the shippers and the online order page is being activated. Enjoy some delightful pickin'! And timely too (with the Chicago Dead shows just in the news). I know some folks that are going to be beating down my door to hear this one! Just listened to the first reel! What a great album! As most of you know, I rarely stray from classical music (except for Carpenters, Joni Mitchell and a few others.) I had never heard Jerry Garcia and even thought Dave Grisman was a pianist! (that was probably Dave Grusin). Anyway, I thought I would sample a little bits of the album, but listened all the way through. First the music is quite delightful - not progressive rock - but more like folk - country music. Both Garcia and particularly Grisman are fine instrumentalists, and Garcia sings in about half the songs, with a pleasant enough voice. The others are instrumentals. Not sure whether the Grateful Dead sound like this - probably am not adventurous enough to try them out, unless they appear in the Tape Project. The sonics are very real - I think a close second to the Little Hatch album, which is the most real of all the TP albums so far IMHO. The tapes are very full - almost 30 minutes for each one - the result I am sure of having the original made for CD lengths, even though recorded in analogue. Those with higher subscription numbers are going to have to wait a bit, but you will have a real treat in store (if you go to the Dagogo show next weekend, Dan will be playing the whole album Saturday night - along with Jacqui Naylor). In fact those with higher subscription numbers either already have their albums or they are currently inbound. All subscriber albums were shipped the same day and we have a few more in stock in the online store which can ship Monday. Thanks for this, Doc and TP staff. Received ours this week as well (# 046). Larry -- I'll listen to Little Hatch, again, and relate observations wrt TP 027. This tape is just amazing. It's been what, eight years? And the Tape Project continues setting the bar!